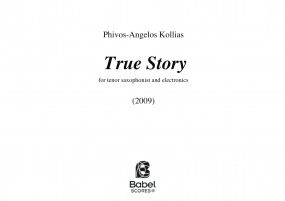 In the music of Phivos-Angelos Kollias, the human element is of central significance. His works, whether they are instrumental or electroacoustic, whether they are composed for films or for concert halls, are influenced by different art forms and the sciences. 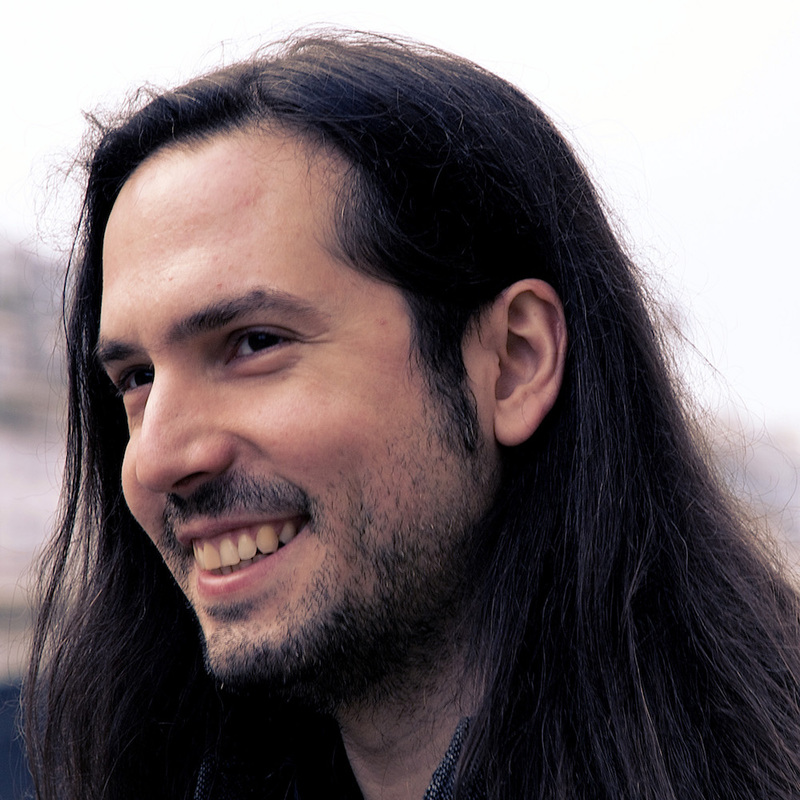 As a composer-researcher, he is exploring the connection of music and the interdisciplinary scientific studies of complexity theories, while he is applying them to his music. Phivos-Angelos Kollias was born in 1982, in Rhodes, Greece, where he started his education in music. He has studied composition in England (Anglia University, Cambridge – Bachelor in Music / City University, London – Masters in Instrumental Composition) and France (Université de Paris VIII – Masters & PhD in Computer Assisted Composition/ Conservatoire de Boulogne, Paris – Degree in Composition) with the support of four foundations (Athens Concert Hall, Onassis Foundation, Leventis Foundation, Greek Composers Union). He has been an active participant at the Composition Workshops of Darmstadt (2006) IRCAM/Acanthes (2010), Acanthes (2011) and Impuls (2013). He has studied composition with H. Vaggione, J. L. Hervé, Y. Maresz, J. M. López López, R. Hoadley and R. Samuel. He has also taken master classes from H. Lachenmann, G. Aperghis, B. Furrer, T. Murail, P. Ablinger, P. Hurel, M. Lanza, U. Chin, O. Strasnoy, A. Hölszky, C. Gadenstätter, L. Naón and A. Di Scipio. He has received seven awards and eight nominations in several international competitions worldwide. His music is published by the French BabelScores. He has been commissioned by organisations like Honig Studios (Germany, 2013/2016), Z.K.M. 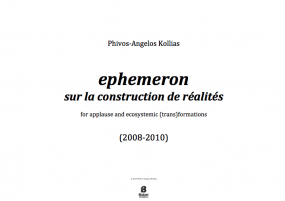 (Germany, 2008 & 2010), Aubagne International Film Festival (France, 2011), University of Boston (USA, 2008), Musiques d’un siècle (France, 2009), Athens Concert Hall (Greece, 2007), Greek Composers Union (Greece, 2010), University of Paris VIII (France, 2007, 2012). He has given lectures about music in different international occasions, in remarkable places like SouthBank (London), National Museum of China (Beijing), European Commission (Brussels), Sorbonne (Paris), Technische Universität (Berlin) French Institute (Athens) or De Montfort University (Leicester); and he has published in music journals like Organised Sound and Leonardo. His works have been performed in more than twenty countries in more than seventy different concerts. He has collaborated with international ensembles and significant musicians for the interpretation of his music, like D. Michel-Dansac, V. Leterme, P. S. Meugé, J.P. Pinet, Le Balcon Ensemble, Dissonart Ensemble, Abstrai Ensemble, Juventas New Music Ensemble, L. Naón, F. Salque, V. Peirani, P. Antoniadis, Ensemble CAPUT, Ensemble Intermodulation, ALEA III Ensemble, T. Antoniou, Greek Ensemble of Contemporary Music and others. Awards: Mobile of the Day of Favourite Website Awards (U.K., 2015) International Competition “SiRAR” of the Aubagne International Film Festival (Aubagne, 2011), International Competition of the Verdi Conservatorio di Musica (Milano, 2009), G.E.R.M.I. Award (Rome, 2009), International Competition InNova Musica (Andorra, 2009), Contemporary Music Workshops of the Athens Concert Hall (Athens, 2008), Greek Festival of Chamber Music (Athens, 2005). Nominations: International Composition Competition OSSIA (New York, 2015), International Competition Franco Donatoni (Milano, 2013), International Competition New Forum Jeune Création (France-Germany, 2012), International Competition Chengdu-Sun River (China, 2011), International Competition Ville de Nice & Alpes Maritimes (Nice, 2011), International Competition Antonín Dvořák (Czech Republic-South Korea, 2011), International Competition ‘Free Style’ (London, 2010), International Competition of the Italian Institute of Culture (Melbourne, 2009).